Comtelco manufactures all base station antennas in our plant in Glendale Heights, Illinois. In developing our designs, we use the latest state of the art test and measurement equipment available. Comtelco antennas are manufactured using proven design techniques and specialized materials that provide economical and reliable long term operation. Our designs are constantly being reviewed and upgraded. We want to be certain that the best possible product is always being shipped. Our omni directional base station antennas are mostly center fed dipoles available in various configurations. Specific applications are addressed by offering both standard bandwidth and wide bandwidth antennas at certain frequencies. Specific mounting options are also available. The construction used in our antennas features copper alloy elements soldered and/or welded for electrical and mechanical integrity. The element structure is encased in a UV inhibited fiberglass radome assuring long life and excellent resistance to harsh environments. This design allows for high power handling capability while minimizing inter modulation. Construction of this type is not usually used in lower cost base station antennas. A complete drain system provides the necessary means of dissipating any moisture build up from condensation caused by temperature fluctuations. Check out the new offerings for 2.4 GHz, 5.8 GHz, and 380 MHz for HOMELAND SECURITY. Our new 1.5" diameter heavy duty BSL series base station antennas are the most robust antennas we have ever offered. Built to stand up to the most demanding applications, they set a new standard for reasonably priced, heavy duty base station antennas. Models available in 3 Radome sizes, Standard 1", Heavy Duty 1-1/2", and Super Duty 2". 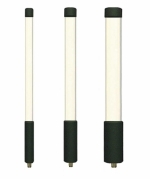 All Comtelco VHF band antennas are available in three different radome diameters. The BSLL series has a super duty 2" diameter radome that provides the most protection of all our omni-directional base antennas. All Comtelco 1.8/2.4 GHz band antennas are available in three different radome configurations. The BSL series has a heavy duty 1 1/2" diameter radome to withstand the most demanding conditions. The BSXL series has a standard duty 1" diameter radome that suits all applications where the BSL is not needed. The BNF/BNM series antenna is a lighter duty, lower cost alternative to the BSXL series. It has a 1/2" diameter radome, 1 1/2" mounting sleeve and a complete drain system for outdoor use. 1.4 GHz 6.5 dBi Gain, 40"
1.8 GHz/2.4 GHz 5dBi Gain, 18"
1.8 GHz/2.4 GHz 7.5 dBi Gain, 24"
2.4 GHz 14 dBi Gain, 60"
5.8 GHz 10 dBi Gain, 18"
5.8 GHz 8 dBi Gain, 8"
The BSLL series has a heavy duty 1 1/2" diameter radome to withstand demanding conditions. Dual Band VHF/UHF Unity Gain, 64"
All Comtelco UHF band antennas are available in three different radome diameters. UHF 4.5 dBd Gain, 60"
UHF 6 dBd Gain, 96"
BSMNT1 Base Station Mount Kit: The BSMNT1 mount kit is designed to be used with shorter BSXL series base station antennas. The mount consists of a single extruded aluminum bracket with a stainless steel V bolt that can handle a mast diameter of up to 2 3/8. UHF 3 dBd Gain, 48"
UHF 4.5 dBd Gain, 62"
Dual Band 3dBi / 5dBi Gain, 36"
BSMNT2 Base Station Mount Kit: The BSMNT2 mount kit is designed to be used with longer BSXL series base station antennas. The mount consists of 2 extruded aluminum brackets and stainless steel V bolts that will handle a 2 3/8 diameter mast. BSLMNT2 Base Station Mount Kit: The BSLMNT2 mount kit is designed to be used with BSLXL series base station antennas. The mount consists of 3 extruded aluminum brackets and 2 long stainless steel V bolts that will handle a 2 3/8 diameter mast. BST Base Station Mount Kit: The BST is a light duty mount kit designed to be used with a BSXL base station antenna less than 36 long. The mount comes with two stainless steel V bolts that will handle a 2 3/8" diameter mast. The mount is black epoxy powder coated. This side mount kit has been designed for use with the Comtelco XL series base station antennas. It is supplied with 1 3/4 stainless U-bolts that will easily mount on a ROHN 45 type tower. If a larger tower leg is being used, stainless steel strapping (not supplied) can be used. These side mounts are very heavy duty with galvanized finish. The BSSMNT10 is 12" high and will move the antenna 25" off the tower leg. All Comtelco 800/900 MHz band antennas are available in four different radome diameters. 700/900 MHz Wide Band Unity Gain, 18"
800/900 MHz Wide Band 3 dBd Gain, 38"
800/900 MHz 3 dBd Gain, 30"
700/900 MHz 5 dBd Gain, 52"
800/900 MHz 6.5 dBd Gain, 64"
The BSL series has a heavy duty 1 1/2" diameter radome to withstand demanding conditions. 800/900 MHz Wide Band Unity Gain, 24"
800/900 MHz Wide Band 3 dBd Gain, 36"
800/900 MHz 5 dBd Gain, 52"